A surfski is a type of kayak originally designed as a surf lifesaving craft to go in and out through the surf break. Surfski kayaks are long – longer than any other kayak, and narrow. They are also narrow and very fast and with big volume upfront and hull made for speed, they are designed to pick up and ride ocean swells. This is what makes surfskis unique in the world of kayaks: the ability ride open ocean swells and waves long before they reach the shoreline. It is this one characteristic that has given rise to the notion of downwind paddling. And because of that, what began as a lifesaving discipline, has developed into a fully-fledged kayaking sport of its own, complete with a World Series and a World Championship. Downwind paddling is paddling on an open body of water with the wind at your back, harnessing the energy of the wind by riding the wind chop, waves and swells generated by the wind blowing over the surface of the water. The stronger the wind and longer time it blows over the surface (this is called the fetch), the rougher, and wilder the ocean gets, eventually creating wave crests called whitecaps or white horses. Eventually these swells come together and become ocean swell, which then eventually become the waves that break on the beach. Basically, those days when the beach is empty and the ocean looks horrible, those are the best days for downwind paddling. I went on my first downwind paddle just over 20 years ago. It was absolutely terrifying. 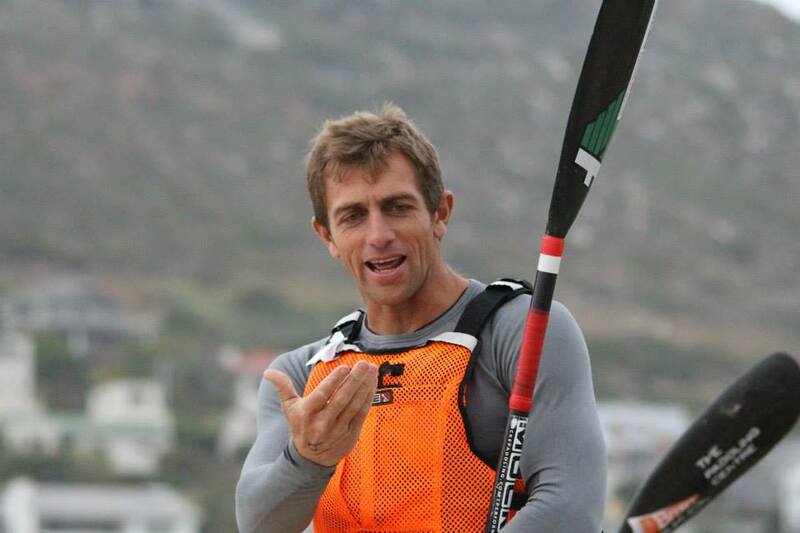 The wind was so strong you couldn’t carry your surfski on your own and your paddle would get ripped from your hand. To talk to someone, you had to shout at them over the noise of the wind. You don’t realise how far from land you are until you are faced with the very possible prospect of having to swim back, and you don’t realise how big the swells are until you are being tossed about only catching short glimpses of the shore. How I lost my courage. With a lump in my throat I left the shore and paddled out to the turn point, a rock 500m offshore with waves crashing over it – not the best confidence inspiring sight as you’re about the set off. Just to get there I had to use every ounce of skill I had learnt as a lifeguard, paddling through waves. I turned and was immediately propelled forward as the swells picked up the back of my surfski. When the wind is blowing at 30knots, and you are trying your best to stay upright on what feels like a floating pencil, kilometres from shore with the very real threat of capsizing, losing your craft and disaster looming, it’s very difficult to get your head around paddling, let alone having fun! I was out there, in this storm, just surviving. Some advice, and an important landmark. Then one of the seniors paddled over to me and gave me some tips. He pointed me to the landmarks I was looking for and reminded me to do the basics – paddle hard for a swell, catch the swell, ride it, wait for another one. It was exactly what I had done in an out from the beach hundreds of times, except now the context had changed, and instead of only catching one wave, I was just repeating the process again and again! Paddling for those swells is a very scary thing to do. Once you match the speed of the swell, it picks up the ski and suddenly you are moving forward at pace, the swell builds and you get pushed towards the steep face and over the crest down the front. As soon as I caught my first swell and rode it towards my landmark in the distance, the puzzle pieces started coming together. What was terror, became exhilaration; that which made me passive made me engage. I made it to the beach alive and exhilarated and was hooked on downwind paddling for life! On that first downwind paddle I had no direction, which led to doubt in my ability and situation, and that doubt led to a reactive and paralysing fear. Doubt is a position between decisions and the fear you feel here leaves you with very little prospects. Instead of being active – taking actions – you are merely reactive – being dictated to by your situation. I was just floating, at the mercy of the winds and waves, and would eventually wash up on the rocks somewhere, far away from where I was meant to be. In this position of doubt and indecision you are at the mercy of the situation, with no control over it. Then somebody came along side me, pointed me to a landmark and encouraged me, reminded me to do the basics – catch a swell and ride it that way. Suddenly, amidst the chaos, I had a clear goal, a vision. Just knowing where I needed to get to gave me the courage to take that first stroke. Taking that first stroke helped me face the fear and catch my first swell. Suddenly what was a threat became an opportunity. I already had all the skills and tools required to paddle downwind – I was on a surfski, had a paddle and could ride swells – all needed was to decide to catch one towards my landmark, my goal my vision. Making that decision dictated what I did next, which was to start paddling, look for the swell and ride it. Suddenly I wasn’t being mastered by the situation anymore, I was now using the situation to get to where I needed to be – in a very exciting way! Life can certainly be a stormy, messy ocean. And when you look at the stormy ocean it can either be one with little or no prospect, heading for disaster, or it can be a stormy ocean full of opportunity to reach a goal or a dream. Whether I was actively paddling, revelling in the situation; or floating in it fearing for my life, the situation didn’t change. At first, all I could see was an ocean of mess, breaking waves all around. My dream of doing this downwind was looking very dim. But once someone came beside me to help and encourage, once I had a goal I was paddling too, and once I started using my abilities, everything changed. Suddenly the waves weren’t threats anymore, they were now opportunities – opportunities to realise my dream of doing a downwind and reaching my goal, my landmark. That is the power of a dream. The dream is like me wanting to do a downwind paddle. The vision is like deciding the route that I am going to do with the wind. The goal is like the landmark that I was paddling towards. Dreams help us create visions, visions give us goals, goals give us tasks to do and when we’ve put the vision, goals and tasks together, we’ve realised a dream. Dreams give us courage – courage to take that first step, and the next one, and the next one until we’re running towards our dream. Dreams give us visions and goals. Visions shape our future and goals give us what we need to do, our tasks. So then, Dreams also shape our actions and outlook on our situation.